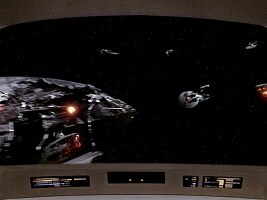 A Borg cube invades Federation space in late 2366 (TNG: "The Best of Both Worlds"). Admiral Hanson gathers a fleet of 40 starships to form a line of defense to prevent the cube from reaching Earth. 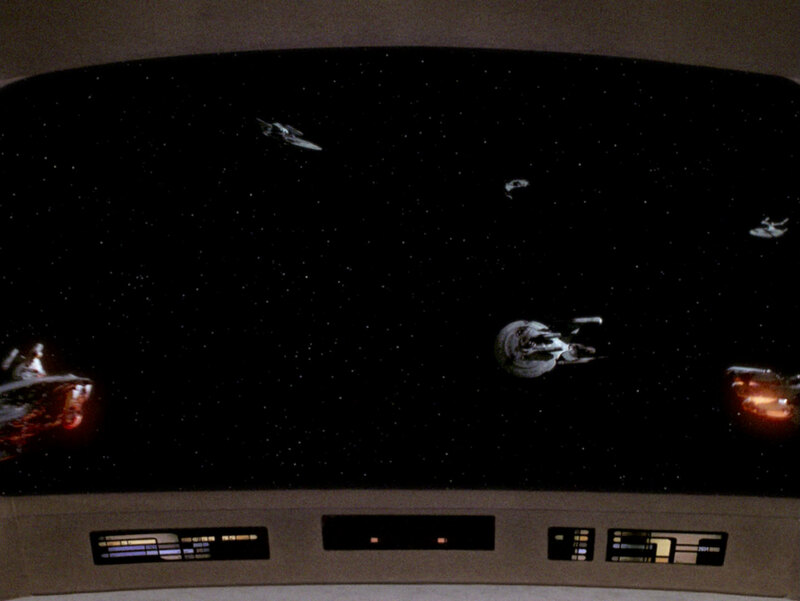 The Federation fleet, however, fights a hopeless battle against the Borg, in the course of which 39 of the 40 ships are destroyed and 11,000 crew members killed (TNG: "The Drumhead"). 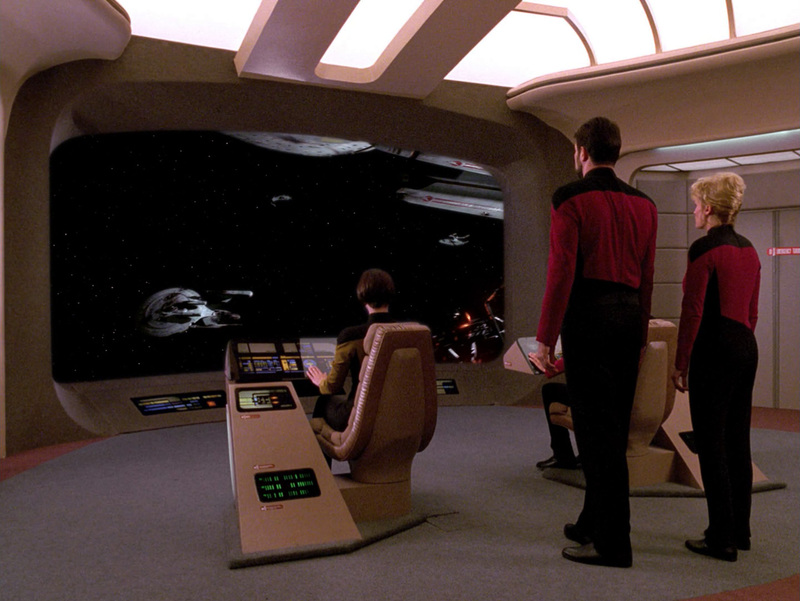 When the Enterprise-D arrives at the scene, the crew finds nothing but a debris field. The "graveyard" scene at Wolf 359 in TNG: "The Best of Both Worlds" (BoBW) features several destroyed or heavily damaged Starfleet ships which have remained unknown for a long time. In the course of this project, we have been able to identify most of the ships in the wreckage. Note that no completely satisfactory solution to all the problems can be presented. Some issues may remain controversial. The Wolf 359 Research Project was initiated and is maintained by Mark Delgado, Balapoel, Bernd Schneider, Chris Spinnler, Timo Saloniemi, Masaki Taniko, The Red Admiral and Nick Angeloni. Visit the associated Wolf 359 sites, Starfleet Engineering Corps and Trekmania for more information about the project. Ambassador USS Yamaguchi NCC-26510 Yes Emissary Destroyed The Yamaguchi was part of the attack formation that consisted of Melbourne, Yamaguchi, Bellerophon and Saratoga. Apollo USS Gage NCC-11672 Uncertain Emissary Destroyed The Apollo-class USS Gage is the only uncertain among the six ships from DS9: "Emissary". There is probably no model of it, and the name is only mentioned in a previous version of the script, although there is still a chance that there is a model of it in an unused shot. 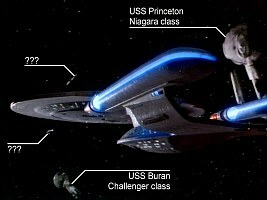 Challenger USS Buran NCC-57580 Yes BoBW Destroyed The Buran is located below the Enterprise-D when the ship enters the debris field. (Unknown) USS Liberator NCC-67016 - The Art of Star Trek Unknown There is only a model of a damaged Type-7 shuttle with the corresponding number and name, so we may presume the ship was present too. However, it is unlikely that there was a model of the ship itself present. Excelsior USS Roosevelt NCC-2573 - Unity Destroyed This ship was only mentioned as a participant of the battle in the Voyager episode "Unity", years after BoBW had been produced; there is no reason to assume an accordingly labeled model was present in BoBW. Excelsior USS Melbourne NCC-62043 Yes Emissary Destroyed When DS9: "Emissary" was about to be produced, it was decided to take advantage of the detailed Excelsior studio model, while the damaged Nebula-Melbourne was barely visible in the background in BoBW. Freedom USS Firebrand NCC-68723 Yes BoBW Destroyed This ship can be seen at the left edge when the Enterprise-D traverses the debris field. Miranda USS Saratoga NCC-31911 Yes Emissary Destroyed Sisko's former ship was prominently featured in the battle. Nebula USS Bellerophon NCC-62048 Yes Emissary Destroyed The Bellerophon was part of the attack formation that consisted of Melbourne, Yamaguchi, Bellerophon and Saratoga. New Orleans USS Kyushu NCC-65491 Yes BoBW Destroyed This ship is in the center of the Enterprise's viewscreen and again in the center when the Enterprise flies through the debris. Niagara USS Princeton NCC-59804 Yes BoBW Destroyed This ship can be seen at the right edge when the Enterprise-D is shown entering the debris field. Oberth USS Bonestell NCC-31600 Yes Emissary Destroyed This ship was seen through the window in the room where Jennifer Sisko died. Rigel USS Tolstoy NCC-62095 Not present BoBW Destroyed This ship is most likely not on screen. Springfield USS Chekov NCC-57302 Yes BoBW Destroyed The Chekov is the ship in the top center of the viewscreen. 1) There is no evidence that the USS Endeavour was at Wolf 359. When Captain Amasov was said to have encountered the Borg in VOY: "Scorpion", this doesn't need to have anything to do with the Wolf 359 Battle. 2) The Federation starship USS Excalibur encountered the Borg too (VOY: "Survival Instinct"). 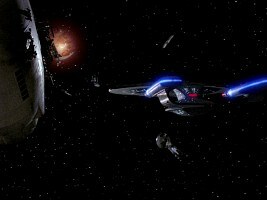 A ship named Excalibur (Ambassador class and therefore not a new ship) appears in TNG: "Redemption", one year after BoBW, as an intact ship. 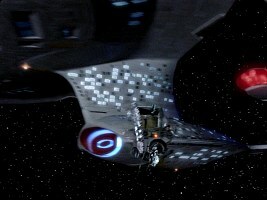 Either this ship was destroyed by the Borg some time after this episode and prior to 2371 when Voyager disappeared, or the ship survived a Borg encounter and only part of the crew was assimilated. There is no need to assume that this happened at Wolf 359. 3) The USS Lalo NCC-43837 was already missing before the fleet gathered at Wolf 359, so it can't be among the 40 ships mentioned in BoBW. 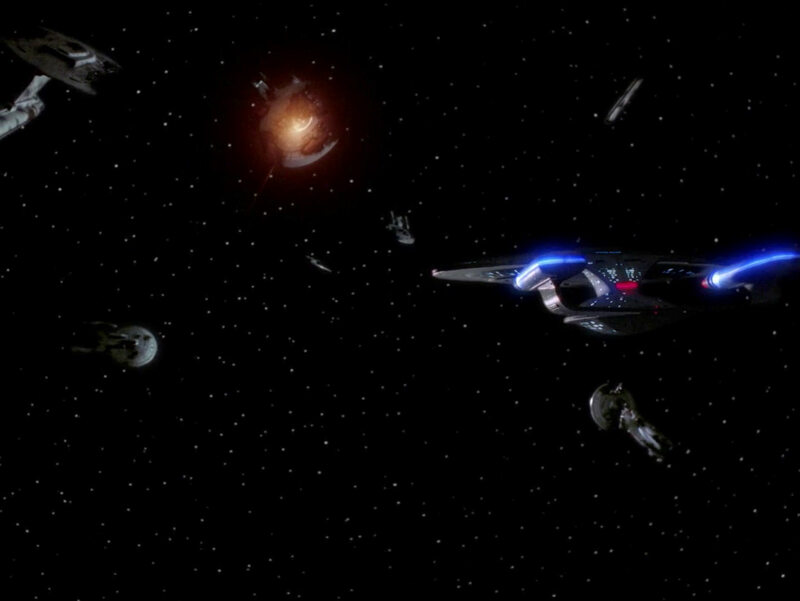 4) Only six ships were visible in DS9: "Emissary" altogether. 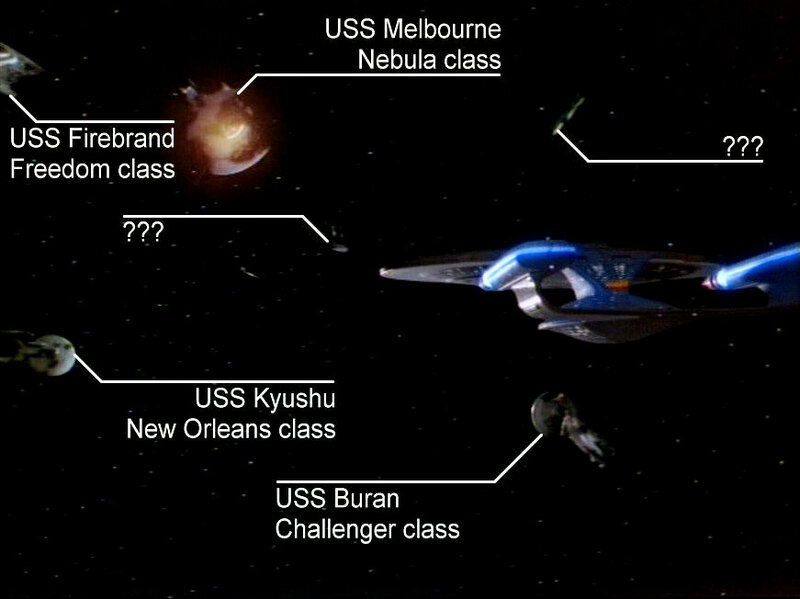 It doesn't make sense to look for these ships in the BoBW scene too, since probably no one cared about these obscure ships when the DS9 pilot was produced. Almost definitely the model makers made up completely new ships that could have taken part in the battle, with the obvious exception of the Melbourne. 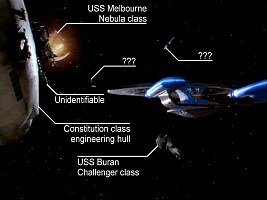 The table gives us 16 ships that have been shown or mentioned, minus one redundant Melbourne. Therefore 15 ships out of 40 have been shown and mentioned so far. The ships seen in DS9: "Emissary" being pretty clear, this analysis focuses on the eight ships of BoBW known by name and on the wreckage visible in this episode. 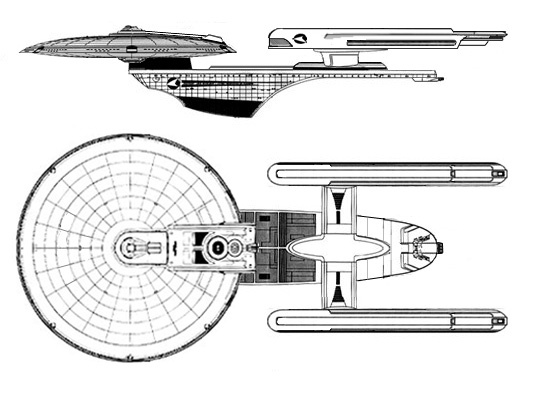 Rigel "A Galaxy-class saucer, attached directly to a Constitution engineering section (no connecting dorsal). Three Galaxy-style warp nacelles; the first two are about where you'd expect, the third is attached directly below the shuttlecraft bay." Freedom "Take the connecting dorsal from a Constitution-class ship. On one end, put a Galaxy-class (-ish) saucer. On the other end, put one Galaxy-class warp nacelle. That's it; no engineering section." 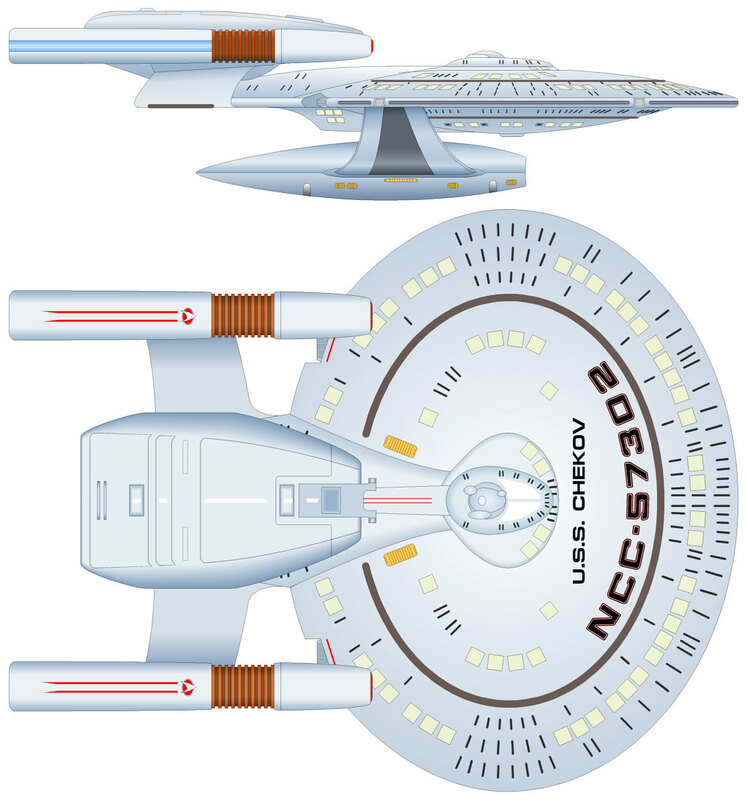 Challenger like the Constitution class, but the two nacelles are Constellation style and attached to the top read end of the saucer. New Orleans "Again, a scaled-down Galaxy saucer (meaning it was made from an Enterprise kit, but with a larger bridge and larger windows, intended to imply a smaller ship). Two nacelles on pylons above the center axis of the ship. I think this was my favorite of the Miarecki study models. At Dan Curry's suggestion, I added two or three 'outboard pods' to the ship in an effort to make it look a little less Enterprise-like. The photos in the Encyclopedia are all photos of the study model, retouched to add lights in the windows. I took the photos just before starting the battle damage work." Cheyenne "This was a scaled-down Galaxy saucer with four nacelles, arranged in a manner similar to the Constellation. Ed made the nacelles from marker pens." Challenger "A scaled-down Galaxy-shaped saucer, and two warp nacelles, one above and the other below the engineering hull." - "The Buran was the above-and-below model that I had thought was the Chekov. I don't recall what Ed's original version of the Buran was, but I added the submarine parts and glued on the engines, although it looks like Ed assembled the engines. I thought it was a clever idea, but it ended up looking like a lollipop. 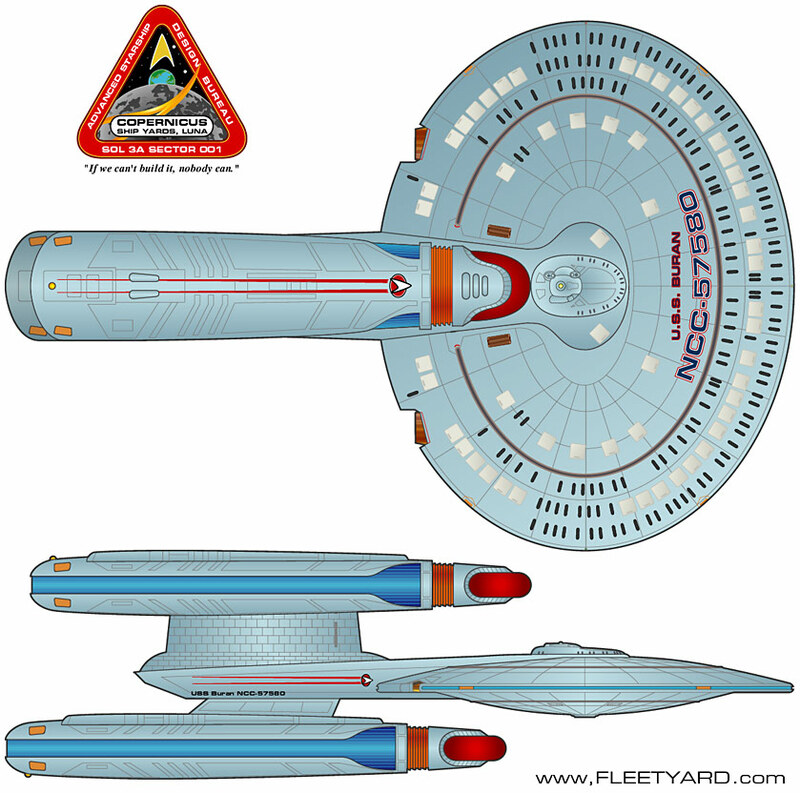 Maybe Ed's version was a single nacelle, and I added the second." Rigel "I don't think we ever came up with a ship design specifically tied to that name. (I'm sure someone will correct me if I'm not remembering correctly. I don't have my notes here at the moment)." Unification. I'm not sure which model this was, and I'm not at all confident that Fact Files checked with anyone." Springfield "The Chekov was built by Ed, based on the small Ent-D model saucer, with two nacelles and marker pen engines." Melbourne "The original version of the Nebula. Ed made us two nearly-identical Melbourne models. I destroyed one of them to create a battle-damaged ship for BoBW2. (I recall being up in the art department one evening, Dremel tool in hand, cutting up the ship, while Patrick Stewart, in Borg costume, came upstairs to use the Xerox machine. He asked me what I was doing. I showed him the model and said something like, 'See what you did!') Rick Sternbach helped with the battle damage, too. And Greg Jein contributed quite a bit of wreckage as well. The other Nebula model ended up on one of the side tables in Sisko's office in DS9. I think it was label 'Melbourne', too." Summarizing, there are definitely models of both the Springfield and the Challenger, while there is probably none for the Rigel. On an earlier version of his website Ed Miarecki took credit for building the following ships: "USS Phoenix, USS Kyushu, USS Ahwahnee, USS Chekov, USS Buran". 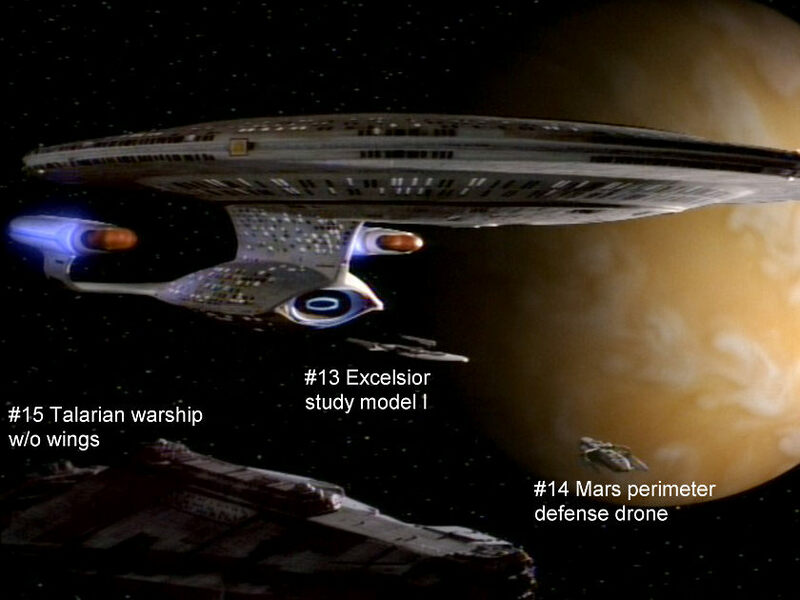 With the exception of the USS Phoenix all of these ships were supposed to be in BoBW. 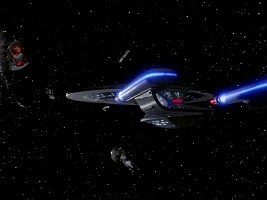 The USS Phoenix being a Nebula-class ship, this could refer to the Melbourne. Okuda confirms this and he even reveals that there were actually two near-identical study models for the Nebula, of which one was damaged for the shots and one was later used for a decoration in Sisko's office and probably in Riker's ready-room in TNG: "Future Imperfect" too. It is not entirely clear in how far these models are actually group efforts. 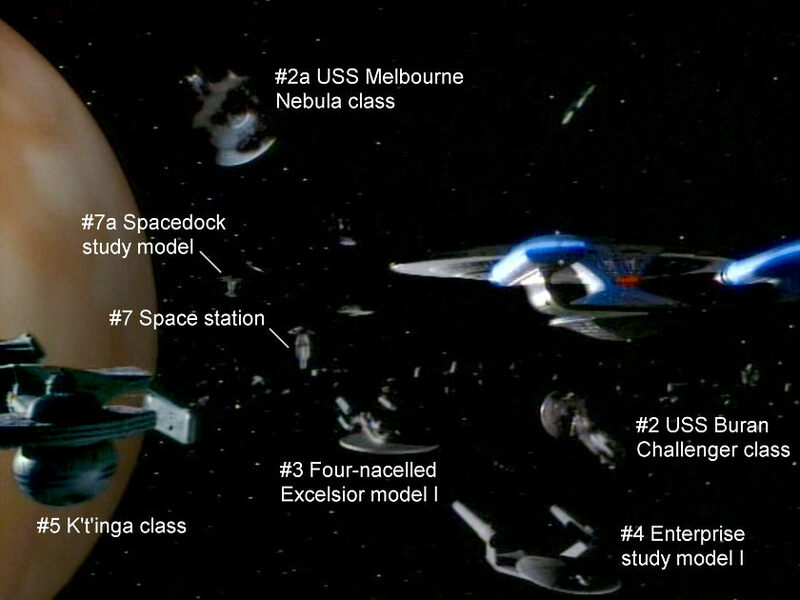 Michael Okuda assigned numbers to the starships and prepared some of them for the shoot, meaning that he partially destroyed them. 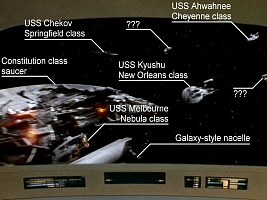 The Chekov was among these ships too. Unfortunately its trace was lost when it was on loan for a VFX test shot. Some wrecks, among them the Freedom-class USS Firebrand, were already built with heavy battle damage by Greg Jein. Okuda also says that all models specifically built for Wolf 359 were supposedly made of Galaxy-class parts. The other TNG era designs were supposed to be "sister ships" of the Galaxy. 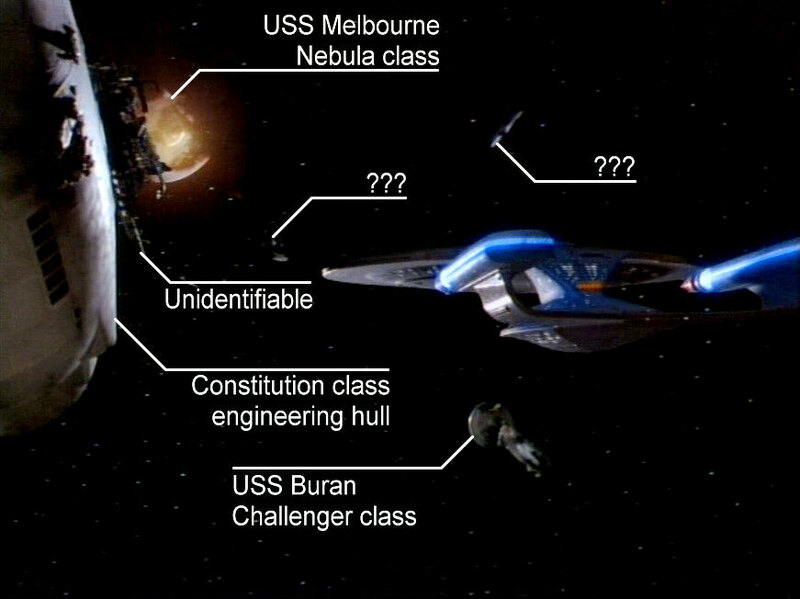 There is probably no ship using Constitution parts, at least no ship with a definite class and registry. Some of the ships were not especially built for BoBW. Supposedly the wedge-shaped prototypes for the never made Trek movie "Planet of the Titans", built by Ralph McQuarrie, as well as the Excelsior study models as depicted in The Art of Star Trek were filmed for the episode. There were not only the two ships depicted in the book, but three or four Excelsior prototypes built by Bill George altogether. Only three of the ships were explicitly mentioned in BoBW, when Shelby identified their wrecks on screen. She said: "The Tolstoy...the Kyushu...the Melbourne". Interestingly this line was supposed to include the Chek(h)ov, the Kyushu and the Melbourne at first. Obviously the producers thought the reference to Pavel Chekov sounded too cute and altered it in the post-production. It is interesting too that the ship's name is spelt "Chekhov" in the script, so it would be a reference to Russian dramatist Anton Chekhov rather than to Pavel Chekov. Moreover, should it be a coincidence that Leo Tolstoy, another famous Russian author, took his place? The name printed on the model, however, is "Chekov". Anyway, the dialogue is not necessarily a hint which starships are actually on the screen. If there was no Tolstoy at all in the filmed scene, this wouldn't affect the dialogue very much, unless someone pointed at the ship. The following HD screen caps act as a short chronological summary of the graveyard scene in BoBW. 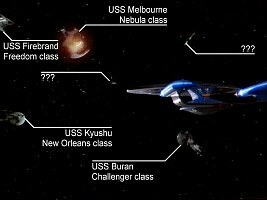 After bugging Michael Okuda and Ed Miarecki with our questions and analyzing screen caps, we have been able to find ships in the wreckage that correspond with the above descriptions and the available footage. Click the links to obtain more information about the single ships. USS Buran Ed Miarecki Yes The Buran is located below the Enterprise-D when the ship enters the debris field. USS Ahwahnee Ed Miarecki Yes With the better screen caps from the DVD it is now clear that the four-nacelled ship in the upper right corner of the Enterprise viewscreen is indeed the Cheyenne class. A very detailed Constitution engineering hull appears just before the commercial break, only to vanish just after the break (see the chronological sequence of screen caps further above). It is most likely the same heavily damaged Enterprise studio model as in "Star Trek III". 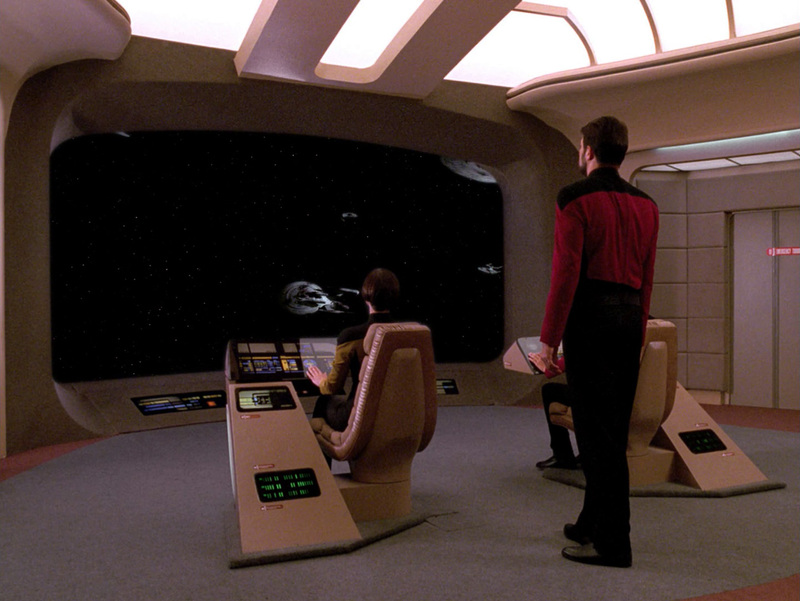 The saucer of the ship is hardly recognizable, but appears before the break on the viewscreen. "USS Alka-selsior" Nilo Rodis & Bill George Only in "Unification"
This is the flattest of the Excelsior study models. 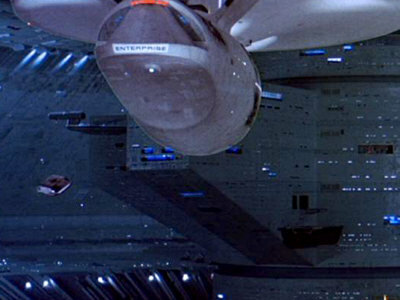 We thought that the ship could be seen in the upper half of the Enterprise-D screen, but eventually identified this one as the Chekov. It is almost certain, however, that the flat Excelsior appears in "Unification" as #13. Unknown Nilo Rodis & Bill George Not yet The second study model from The Art of Star Trek already resembles the final Excelsior. We previously presumed that the ship we now classify as Challenger could be the study model II. Unknown Nilo Rodis & Bill George Not yet The second study model from The Art of Star Trek is very close to the final Excelsior. It has not been identified to date. Unknown Nilo Rodis & Bill George Only in "Unification"
This ship is visible in "Unification" as #3, but was not identified in BoBW so far. Unknown Nilo Rodis & Bill George Only in "Unification" This ship is visible in "Unification" as #10, but was not identified in BoBW so far. USS Firebrand Greg Jein Yes This single-nacelled ship, built already with battle damage by Greg Jein, can be seen at the left edge when the Enterprise-D is shown entering the debris field. Two "Proto-Nebula" study models were built by Ed Miarecki before the final Nebula was created. 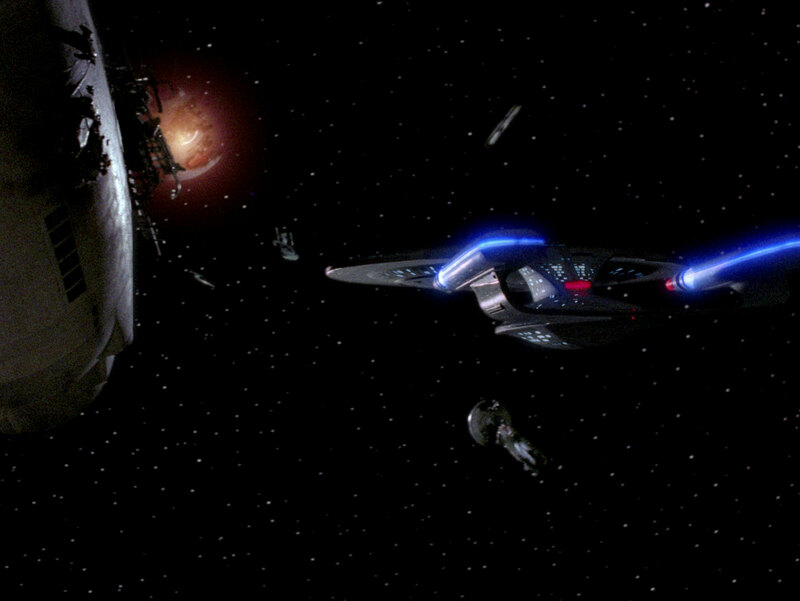 The one with the small nacelles at the very rear end was heavily damaged and can be seen as the burning ship in the top center when the Enterprise flies through the debris field. This ship is clearly identifiable in the center of the Enterprise's viewscreen and again in the center when the Enterprise flies through the debris. USS Princeton Greg Jein Yes This three-nacelled ship can be seen at the right edge when the Enterprise-D is shown entering the debris field. None Ralph McQuarrie Only in "Unification"
The Art of Star Trek states that two wedge-shaped prototypes originally built for Star Trek Phase II back in 1977 were among the ship wrecks at Wolf 359. More correctly, these models were built as soon as for a Trek movie called "Planet of the Titans" that was never made. Anyway, variant I can be identified as one of a few additional ships (besides an additional planet) in a modified scene in TNG: "Unification" as #4. We believe that the very same take was originally made for BoBW and then inserted into the foreground. Variant I could not be identified in BoBW or "Unification", but was recently found in the Spacedock scene in "Star Trek III". 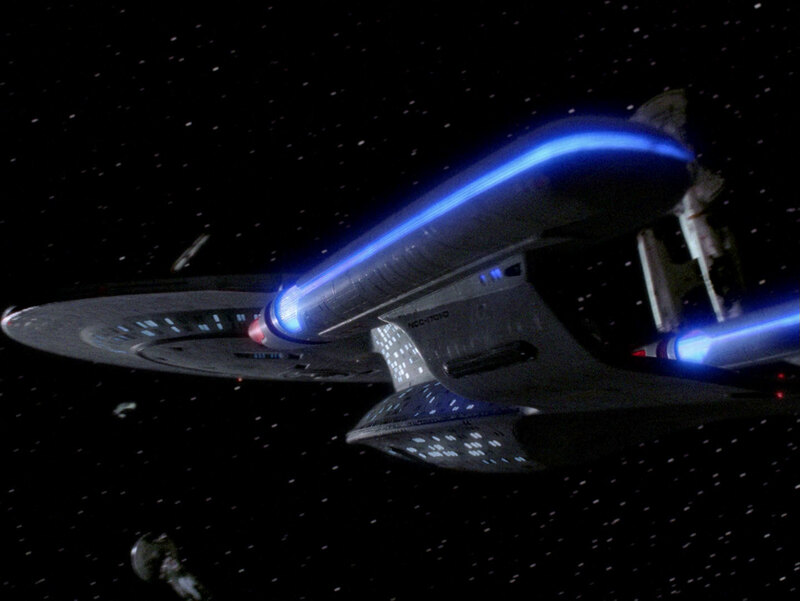 None Ralph McQuarrie Only in "Star Trek III"
USS Tolstoy - Non-existent This ship is most likely not on screen. USS Chekov Ed Miarecki Yes We are quite sure that the Chekov is the ship in the top center of the viewscreen. 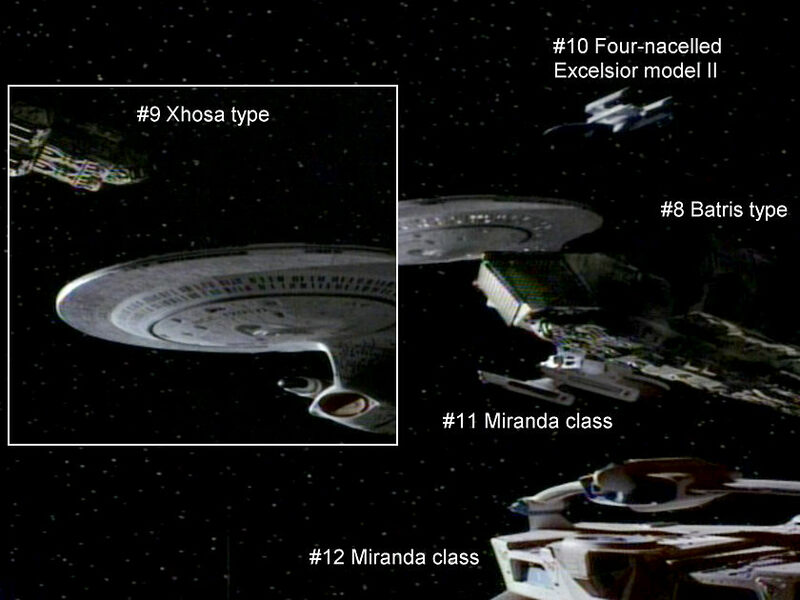 The ships so far identified in "The Best of Both Worlds" are labeled on the following screen caps. It would have been the wrong approach to take the number of 39 ships and try to find them all in the wreckage. Probably no more than the eight BoBW ships in the list at the top of this page did actually have a proper class, name and registry. There were quite a few "Enterprises" and "Excelsiors" and even an "Alka-selsior" among the wrecks if we could have a (too) close look. Most of the starships, especially those in the far background, might remain and maybe better remain a mystery. 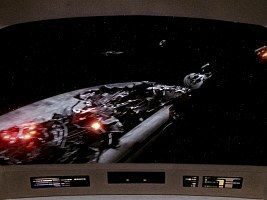 Some of the other vessels could recently be identified on screen, and with a bit more research this should be possible for the remaining ships likewise. We will further pursue this goal and keep this page updated. It would be up to those who were involved in the production of the episode, Mike Okuda and Ed Miarecki for instance, to clarify the issue. After all, some better pictures from Okuda's slide show must be somewhere out there. 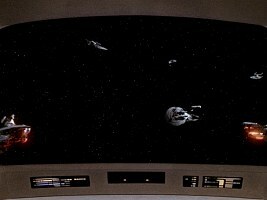 Analysis of the Qualor II Surplus Depot - identifying the ships in TNG: "Unification"
All HD screen caps by TrekCore. We would like to express our gratitude to Mike Okuda and Ed Miarecki who provided several pieces of first-hand information. Thanks to Frank Gerratana and Pedro's Shiporama for some of the screen caps, Gary Perry for many pics, Steve Pugh for the descriptions of the "slide show ships", David, djdood, Harry, J, Jason, Jonah, Joshua, Lance, Markus, Patrick, Paul, Regent, Ryan and several people at the Flare Sci-fi Forums for pics and valuable hints.